40 Hereford is located on the SE corner of Commonwealth and Hereford, with 32 Hereford to the north, across Commonwealth, 46 Hereford to the south, across Alley 431, 308 Commonwealth to the east, and 314 Commonwealth to the west, across Hereford. 40 Hereford was designed by architects Shaw and Hunnewell and built in 1886-1887 by George F. Shepard and C. E. Clark, builders, as the home of cotton merchant Francis Williams Sargent and his wife, Jane Welles (Hunnewell) Sargent. Jane Sargent was the sister of Henry Sargent Hunnewell of Shaw and Hunnewell. Francis Sargent is shown as the owner of 40 Hereford on the original building permit application, dated March 9, 1886, and on the final building inspection report, dated September 22, 1887 (both of which show the address as 42 Hereford). Bound with the building inspection report, located in the Boston Public Library’s Arts Department, is a water-damaged floor plan for the first floor. Jane (Hunnewell) Sargent purchased the land for 40 Hereford on May 2, 1885, from Mary Elizabeth (Dana) de Cordova, the wife of Julian de Cordova. They lived in Lincoln. He was tea broker and investor, and later would acquire the Union Glass Company in Somerville. They had married in June of 1876 and purchased the land on May 28, 1878, probably with the intention of building a home in the Back Bay. The lot had been part of a tract of land originally purchased by Nathan Matthews on January 2, 1871, from David Sears, Jr., Frederick R. Sears, and Knyvet Sears. Click here for an index to the deeds for 40 Hereford. By the 1887-1888 winter season, the Sargents had made 40 Hereford their home. They previously had lived at 183 Marlborough and in Wellesley, where they continued to maintain a home. 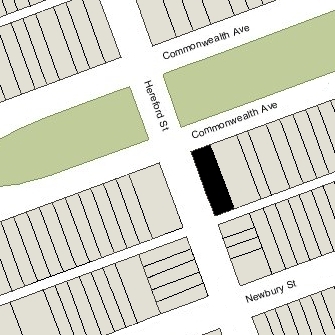 In August of 1889, Jane Sargent’s father, Horatio Hollis Hunnewell, purchased the vacant lot across the street, at the southwest corner of Commonwealth and Hereford. He retained the lot until January of 1899, when he sold it to real estate dealer James Goldthwaite Freeman, who then conveyed it Alice (Haskell) Burrage, the wife of Albert Cameron Burrage. The Burrages subsequently built their home at 314 Commonwealth. In the deed selling the vacant lot, H. Hollis Hunnewell included language for the benefit of the Sargents’ property specifying that, for the next twenty years, only a dwelling house could be built on the land at 314 Commonwealth and that the height of any house could not exceed four and one-half stories (and no more than 65 feet) and the depth could not exceed 85 feet (but allowing one story extensions further south to the alley). During the 1889-1890 winter season, the Sargents were living elsewhere and 40 Hereford was the home of Robert Chamblet Hooper and his wife, Helen Angier (Ames) Hooper. They had lived at 183 Commonwealth in 1889. The Hoopers moved soon thereafter to a new home they had built at 448 Beacon. The Sargents were once again living at 40 Hereford by the 1890-1891 winter season. 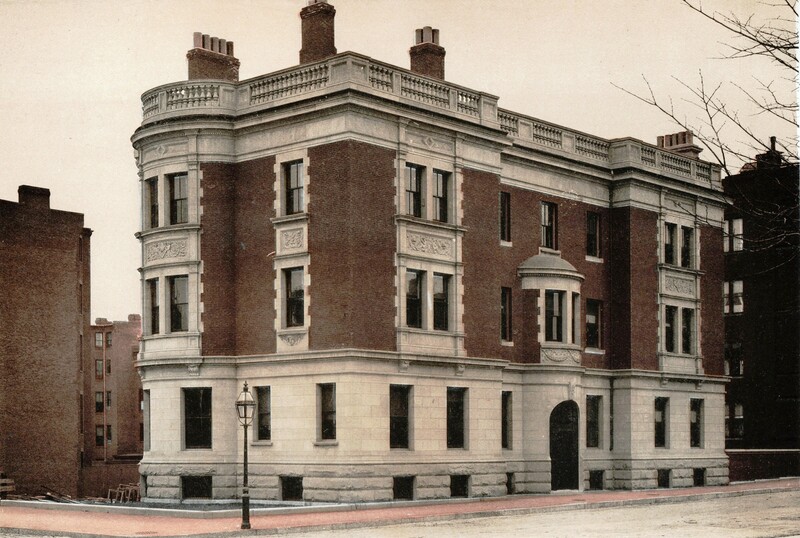 They continued to live there during the 1895-1896 season, but moved thereafter to 130 Beacon to live with Jane Sargent’s widowed father, Horatio Hollis Hunnewell. 40 Hereford was not listed in the 1897 Blue Book. During the 1897-1898 winter season, it was the home of attorney William Vail Kellen and his wife Ella Frances (Sturtevant) Kellen. They previously had lived at 317 Dartmouth. By 1899, they had purchased and moved to 202 Commonwealth. 40 Hereford was not listed in the 1899 Blue Book. During this period, the Sargents had continued to live with Horatio Hunnewell at 130 Beacon. In late 1899, they moved back to 40 Hereford with their children: Jane Welles Sargent, Francis Williams Sargent, Jr., Henry Jackson Sargent, Daniel Sargent, Margarett Williams Sargent, and Ruth Sargent. Ruth Sargent, a child of five, was killed on February 7, 1902, when she was run over by an electric street car on Boylston. Jane Sargent married in June of 1907 to Dr. David Cheever, a surgeon, and they moved to 20 Hereford. Francis Sargent, Jr., a banker, married in September of 1914 to Margery Lee. After their marriage, they lived in Dedham. He died in June of 1919. Francis Sargent, Sr., died in January of 1920. Jane Sargent continued to live at 40 Hereford and in Wellesley with their unmarried children: Henry Jackson Sargent, Daniel Sargent, and Margarett Williams Sargent. Daniel Sargent married in June of 1920 to Louise Riché Coolidge. He was an author and instructor at Harvard. After their marriage, they lived in South Natick. Margarett Williams Sargent, an artist, married in July of 1920 to Quincy Adams Shaw McKean, a stockbroker. He previously had lived at 13 Commonwealth with his step-father and mother, Malcolm Graeme Haughton and Marian (Shaw) McKean Haughton. After their marriage, the McKeans lived at the Hotel Agassiz at 191 Commonwealth and in Prides Crossing. Henry Jackson Sargent remained unmarried and continued to live at 40 Hereford with his mother. In 1931, he was the sole survivor of an arctic filming expedition aboard the Viking. The expedition was organized by Varick Frissell to make a motion picture about a seal hunt. The boat exploded and the entire Frissell party, except for Henry Sargent, was killed. Mrs. Sargent and Henry J. Sargent continued to lived at 40 Hereford until her death in September of 1936. On September 29, 1937, 40 Hereford was acquired from Jane Sargent’s estate by real estate dealer Ray C. Johnson. The house was shown as vacant in the 1938-1940 City Directories. On October 7, 1939, 40 Hereford was acquired by Phyllis A. Goodman. She was an employee of the Commercial Finance Service Corporation and acted on behalf of its president, William Karmazine, in various real estate transactions. The deed was not recorded until March 15, 1940, and Ray Johnson remained the assessed owner in 1940. In January of 1940, he applied for (and subsequently received) permission to convert the property from a single-family dwelling into a lodging house. On March 15, 1940, Phyllis Goodman transferred 40 Hereford to William Karmazine as trustee of the Esdith Realty Trust. He and his wife, Edna (Nurenberg) Karmazine, lived in Chestnut Hill. He established the Esdith Realty Trust for the benefit of his two daughters, Esther Reece Karmazine and Judith Shaefer Karmazine. and his niece, Enid Esta Karmazine, daughter of his brother, Nathan Karmazine and his wife, Mae (Lipsher) Karmazine. From about 1941, 40 Hereford was the home of Thomas MacAllister Wallace and his wife, Edna D. (Cayouette/Cowett) Black Wallace, who operated it as a lodging house. They previously had lived at 12 Haviland. They continued to live at 40 Hereford until about 1948. In October of 1948, William Karmazine filed for (and subsequently received) permission to convert the property from a lodging house into a private vocational school to be operated by Miss Farmer’s School of Cookery. The filing was made in anticipation of the property’s sale. On January 3, 1949, 40 Hereford was purchased from William Karmazine by Miss Farmer’s School of Cookery, Inc. It operated the Fannie Farmer cooking school there until the late 1970s. It also maintained a dormitory at 40 Hereford for students of the school. On June 14, 1978, 40 Hereford was purchased from the school by Eugene W. Friedrich, trustee of the 40 Hereford Street Trust. 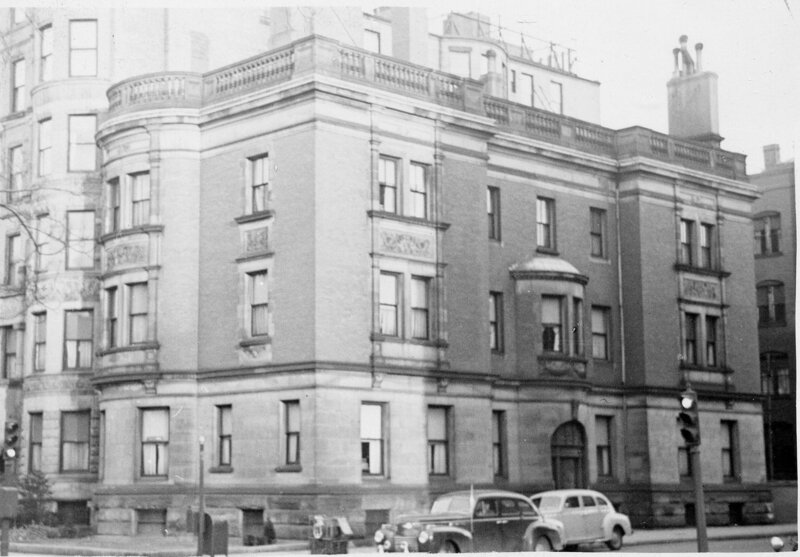 In August of 1978, the trust filed for (and subsequently received) permission to convert the property into six apartments. 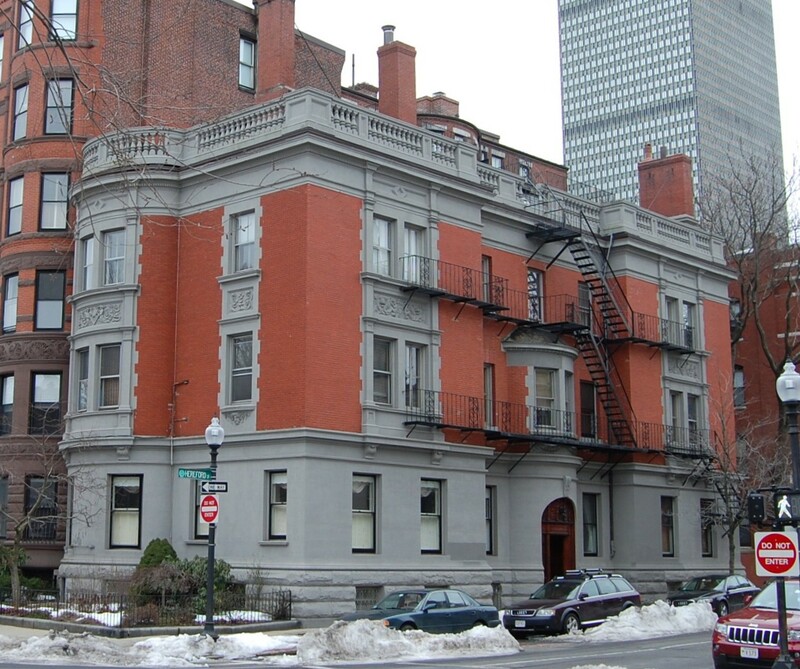 On December 21, 1978, it converted the apartments into six condominium units, the Forty Hereford Street Condominium.